A pair of talks at the third meeting of the Vit-Buckle Society reviewed systemic safety and injection protocol concerns of anti-VEGF injections. The third meeting of the Vit-Buckle Society (VBS) was held at the Fontainebleau Hotel in Miami Beach, Florida, in March 2015. Through generous support from Genentech, the VBS awarded travel grants to 20 retina fellows. Fellows who attend the VBS meetings become an integral part of meeting coverage and are involved with writing summaries of the meeting’s presentations. These summaries capture both the academic rigor of which the VBS prides itself and the open atmosphere that makes the VBS meeting one of the most dynamic in retina. Each year, New Retina MD partners with the VBS to bring readers the VBS Notes series, offering year-round coverage of the meeting’s thought-provoking podium presentations. Below, second-year fellows Yasha S. Modi, MD, and Daniel Chao, MD, PhD, review presentations by Robert L. Avery, MD, and Harry W. Flynn Jr, MD. Robert L. Avery, MD, presented a compelling talk entitled, “Systemic Safety Concerns With Anti-VEGF Agents,” in which he reviewed the literature pertinent to this controversial subject. He discussed case reports suggesting that fellow eye effects occurred shortly after the treated eye received intravitreal bevacizumab (Avastin, Genentech). One case report described a patient with active bilateral proliferative diabetic retinopathy who received intravitreal bevacizumab in the right eye. One week after the injection, the fellow eye demonstrated reduced leakage on fluorescein angiogram. At 2 weeks after presentation, repeat fluorescein angiogram demonstrated return of leakage to baseline level, suggesting a transient but demonstrable contralateral effect after intravitreal bevacizumab injection. Additional case reports described apparent bilateral effects of unilateral bevacizumab in retinopathy of prematurity and in diabetic macular edema (DME). Although Dr. Avery acknowledged that there might be inherent fluctuations in DME between visits, he argued that the reduction in retinal thickening within 1 week was likely too profound to be attributable to chance alone. This apparent effect was also seen in patients injected with aflibercept (Eylea, Regeneron). In a study of 25 patients who received unilateral aflibercept injections, there was on average a 43-µm reduction in edema in the contralateral eye. Another report evaluated the fellow-eye effects seen in DME with bevacizumab and ranibizumab (Lucentis, Genentech) treatments; these authors noted contralateral reduction in the bevacizumab group but not the ranibizumab group. Dr. Avery proceeded to report on the differences in pharmacokinetics and pharmacodynamics among the three anti-VEGF drugs used to treat age-related macular degeneration (AMD). He noted that, after intravitreal injection, systemic drug concentrations of aflibercept and bevacizumab are many times higher and longer-lasting than systemic ranibizumab levels. This difference correlates with significantly suppressed plasma VEGF levels seen in patients receiving bevacizumab and aflibercept within the first week after administration, but only a minimal reduction in systemic VEGF levels after ranibizumab administration. Dr. Avery concluded that all three agents rapidly move into the bloodstream, but ranibizumab clears more quickly, whereas bevacizumab and aflibercept demonstrate durable systemic exposure with resultant sustained reduction of systemic VEGF levels. Dr. Avery sought to explain what accounts for the systemic VEGF reduction seen after injections of bevacizumab and aflibercept but not ranibizumab. This effect can be explained, he proposed, by the differing structures of the three molecules. Specifically, the Fc fragment, or antibody backbone, of the bevacizumab and aflibercept molecules is believed to prolong the half-life of the drugs by engaging with the Fc receptor on endothelial cells. This interaction not only allows translocation across the blood-retina barrier but also is believed to rescue immunoglobulin from catabolic elimination after entering systemic circulation. In contrast, ranibizumab, lacking the Fc region, persists for only a few hours in the systemic circulation before undergoing breakdown. Dr. Avery reviewed data from a number of large-scale trials of anti-VEGF agents to see whether any differences in safety or efficacy had been noted among the drugs. Randomized clinical trials that have compared anti-VEGF drugs with placebo have not consistently demonstrated serious systemic effects of the drugs, he said. However, Dr. Avery pointed out that none of these studies was powered to detect such a difference. In the CATT study, he noted, a higher cumulative proportion of systemic serious adverse events (SAEs) was seen in the bevacizumab arms relative to the ranibizumab arms at 1 and 2 years. However, a meta-analysis of nine studies did not detect a statistically significant difference in systemic SAEs between bevacizumab and ranibizumab. Dr. Avery contended that this discrepancy was influenced by the fact that the meta-analysis overestimated the number of SAEs from what was published in the LUCAS study, which compared ranibizumab and bevacizumab. Dr. Avery also noted that the RISE and RIDE trials, parallel studies evaluating two doses of ranibizumab (0.3 mg and 0.5 mg) and sham treatment for DME, reported a slightly higher rate of stroke in the 0.5-mg arms. This suggests that higher doses of anti-VEGF agents may have systemic adverse effects in this potentially vulnerable population, he said. This finding ultimately factored into Genentech’s request for the US Food and Drug Administration to approve a 0.3-mg dose of ranibizumab for the treatment of DME. Finally, in evaluating the safety profile of aflibercept, the European Public Assessment Report (EPAR) drew attention to increased cerebrovascular events with aflibercept relative to ranibizumab in the VIEW 1 and VIEW 2 studies, which investigated aflibercept as a treatment for wet AMD. This effect was particularly apparent in patients older than 85 years. Dr. Avery concluded that intravitreal anti-VEGF agents can enter the circulation and can reduce systemic VEGF. This VEGF reduction is most apparent with aflibercept and bevacizumab, likely due to the presence of the Fc region, which rescues the antibody from systemic catabolism. These systemic effects can be observed by evaluating the fellow-eye response. While intravitreal anti-VEGF therapy is generally safe for most patients based on data from randomized controlled trials, these studies were not adequately powered to detect differences in uncommon adverse events between drugs. Dr. Avery posited that systemic safety remains unclear in at-risk patients (eg, those with recent stroke, neonates with retinopathy of prematurity), and use of the drug with lowest systemic exposure is reasonable in these patients. Yasha S. Modi, MD, is a second-year retina fellow at the Cole Eye Institute. Dr. Modi may be reached at yasha.modi@gmail.com. Although the VBS meeting focuses on vitreoretinal surgery, it is difficult to have a retina meeting without discussion of intravitreal injections. Harry W. Flynn Jr, MD, of the Bascom Palmer Eye Institute gave an update on evolving guidelines for intravitreal injections between 2004 and 2014. The changes made over the course of a decade reflect the evolution of clinical retina practice using intravitreal injections. Pupillary dilation and speculum use, thought to be necessary in 2004, are listed as optional under the new guidelines. Also in the new guidelines, antibiotics are thought to be unnecessary, and actually their use may result in the development of more virulent antibiotic-resistant flora. In the 2014 guidelines, using a mask or minimized speaking are recommended to reduce contamination from aerosolized moisture droplets. A key principle in both the 2004 and 2014 guidelines is the use of povidone-iodine for antisepsis. In the 2014 version, the use of povidone-iodine on the lids and lashes was listed as “optional,” but povidone-iodine should be the last solution to coat the ocular surface before the injection. In patients with a reported allergy to povidone-iodine, a focal application of povidone-iodine at the site of injection or a skin application test can be considered. Dr. Flynn’s discussion focused on a number of unresolved issues about intravitreal injections. Elevated intraocular pressure (IOP) following intravitreal injection was a hot topic of conversation. At the Bascom Palmer Eye Institute, the nurse applies moderate pressure with a cotton swab dipped in 4% lidocaine at the site of injection and then applies povidone-iodine, which softens the eye and lowers IOP, as demonstrated in a study done at the Miami Veterans Affairs Medical Center and Bascom Palmer.3 Anterior chamber paracentesis to lower IOP in patients with advanced glaucoma can be considered but is generally avoided. Philip J. Rosenfeld, MD, commented that it has been shown that the postinjection return to baseline IOP levels is slower in patients with glaucoma; it is unclear, however, whether the IOP elevation from intravitreal injections causes increased damage to the optic nerve in these patients. Dr. Rosenfeld also stated that he now incorporates a drop of ketorolac, a nonsteroidal antiinflammatory drug (NSAID), while prepping the patient. He believes that this NSAID has greatly improved the postoperative comfort of his patients. During audience engagement, Dr. Avery offered an important point: That if one uses an anesthetic gel, the guidelines recommend that povidone-iodine be applied both before and after gel application, as it is thought that application of the gel may prevent adequate antisepsis if povidone-iodine is applied only after the gel. Daniel Chao, MD, PhD, is a second-year vitreoretinal fellow at University of California, San Francisco. He states that he is a consultant for Allergan. Dr. Chao may be reached at Daniel.Chao@ucsf.edu. 1. Aiello LP, Brucker AJ, Chang S, Cunningham ET Jr, et al. 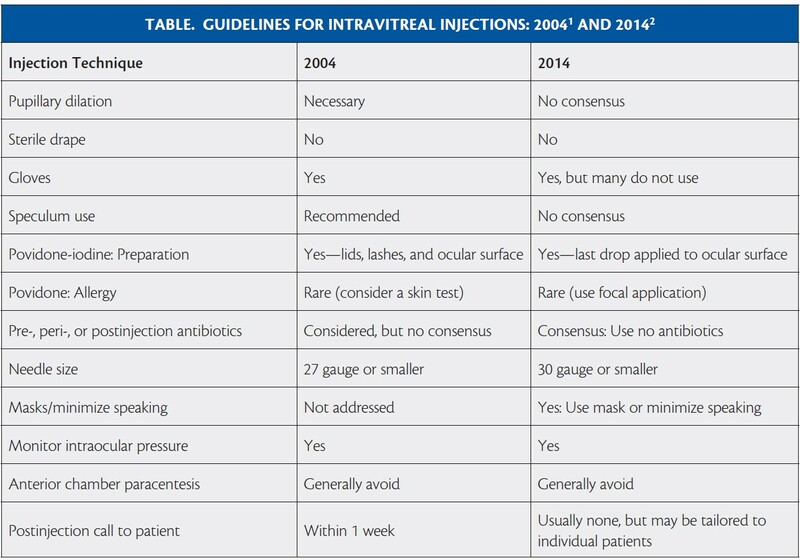 Evolving guidelines for intravitreous injections. Retina. 2004; 24(5):S3-19. 2. Avery RL, Bakri SJ, Blumenkranz MS, et al. Intravitreal injection technique and monitoring: updated guidelines of an expert panel. Retina. 2014; 34:S1-S18. 3. Gregori NZ, Weiss MJ, Goldhardt R, et al. Ocular decompression with cotton swabs lowers intraocular pressure elevation after intravitreal injection. J Glaucoma. 2014; 23(8):508-512.